There are millions of people around the world that experience leaky roofs. You’ll want to quickly fix a leaky roof to prevent water damage in your house. There are many causes that could be causing your roof to leak, but leaving the job to a professional is best. You’ll need to do a few things to temporarily stop your roof from leaking until a professional arrives. Here you’ll learn how to minimize interior damage, locate point of entry, maintain the situation and repair shingles. The first thing you’ll need to do is find the wettest spot in the ceiling, and poke a small hole in the middle of it. Be sure to use a bucket to catch the water before you poke a small hole in your ceiling. Leaks will try to find an exit in your ceiling, and it’ll make the leak look worse than it actually is. Poking a hole in the wettest spot of your ceiling will minimize interior damage since it will now have a primary place to exit. The second thing you’ll need to do is locate the point of entry. You’ll need to start in your home and in your attic to start off. The leak in the ceiling and the leak in the roof may not align. 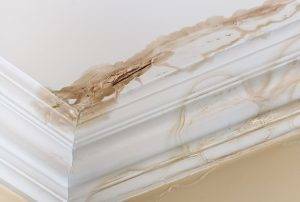 If your roof covering is over a layer of plywood, the water will usually travel from the leak in the roofing material to the nearest joint in the plywood. Once you locate the point of entry, you should consider covering the hole with roofing tape, roofing cement or a tarp. Roofing tape and cement can be applied to the inside and outside of the roof. If you prefer to use a tarp to temporarily cover the leak on the outside, be sure to cut the tarp so that it’ll cover the damaged area. You’ll need to leave four feet of tarp on each end to cover the damage. After you complete these steps, be sure to secure the tarp with wooden boards. You can staple or nail the tarp to the boards, but it’s important that you don’t use long nails. You don’t want long nails going through your roof. After you locate the point of entry in your home, be sure to examine the roof for any damage on the exterior. You’ll need to check roofing material directly above the leak. If your roof is slanted, you’ll need to inspect areas on the roof that are higher than where the leak enters your home. Be sure to look for curled, damaged or missing shingles where the leak is coming in. You’ll need to look closely for exposed roof tacks as well. If any of your shingles are curled, be sure to straighten them. If temperatures are cold, you’ll need to soften the shingle edge with heat such as an electric hair dryer. Never use a torch or other open flame heat source since asphalt shingles are flammable. Excess heat will ruin shingles. You’ll need to attach curled shingles after you straighten them with a generous amount of asphalt cement or compound around exposed edges. If any shingles are damaged, you’ll need to replace them. If your shingles lift off of your roof with little effort, break or crumbles, it needs to be replaced. Simply remove the old shingle by lifting its edges and taking out the nail. You’ll then need to scrape the area underneath to remove any remaining roofing cement. Be sure to use a sharp utility knife to slightly round the back corners of the new shingle. Lastly, you’ll need to slide the shingle in its proper place. You’ll want to cover the nailheads with roofing cement. It’s important to use caution when going on your roof. Be sure to wear rubber-soled shoes, and secure the ladder to the siding or the fascia with ropes to prevent it from being blown in the wind. If you have a leaky roof, you need to call a professional immediately. A roofer will be able to fix the damage and prevent further issues. Even though you could possibly fix these issues yourself, a professional roofer will have a lot more experience and knowledge. If you attempt to fix the issue yourself, you could be putting yourself at risk for experiencing future leaks and damage. 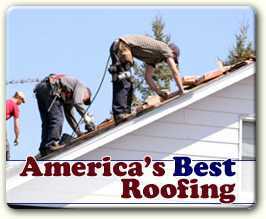 If your roof requires repairs, you want to be sure that it’ll be done correctly, efficiently and professionally. America’s Best Roofing is a family-owned business that specializes in roof maintenance, roof repairs, roof installation and roof cleaning. 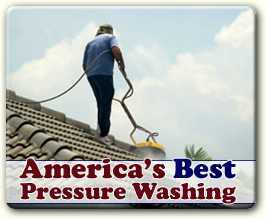 America’s Best Roofing checks to make sure that all of their customers are satisfied before the project is complete. You can trust that we have the experience and knowledge to help you.